About a year ago I had made a post about a Boeing 727 House in Bolivar, Benoit, USA. 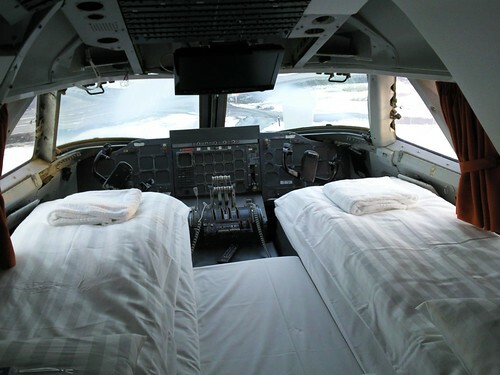 Today I present a complete hotel built inside a decommissioned Boeing Jumbo 747-200 known as "Jumbo Hostel" now grounded and anchored near the Arlanda Airport, Stockholm, Sweden. The Boeing 747-200 Jumbo jet was originally built in 1976 for Singapore Airlines who later sold it to Pan Am. Its last owner was Transjet, a Swedish airline, that went bankrupt in 2002. In words of the man behind idea of Jumbo Hostel, Oscar Diös, "I was getting ready to expand my hostel business in 2006 when I heard about an old wreck of an aircraft for sale at Arlanda. Since I had for a long time wanted to establish my business at Arlanda I didn’t hesitate for a second when this opportunity struck." This unique hotel, first of its kind in the World, was opened in 2008 and has 25 rooms with single/double/triple beds, shared dormitory and a luxury twin bed suite in the cockpit of the plane. The toilet facilities for the boarders are in the corridor and are shared with others. However the cockpit luxury suite is provided with its own shower and WC. The hotel also has a meeting lounge and restaurant which is open to non-boarders also. Note: Since satellite imagery is old it is not yet visible in Google Earth/Maps. Credits: I am thankful to SSH who brought this unique hotel to my knowledge. Thank you SSH. Good. It should be fun and don't forget to take some good photos for inclusion in this post!